A pasta bar in a little lane of Melbourne CBD… we were lucky enough to get a table for 3 on a Thursday night. I’ve tried several times from walk-in or phone bookings, but they seem to be always booked out – or i’m such a last minute booker. Highly rated (been on good food reviews), so I really needed to find out how good it is over a girls night out. We all ordered a mocktail of spiced plum, when I heard the description from the waitress, it didn’t feel like a refreshing drink, but after ordering it, yes it was refreshing – and not much spice. So I was happy but wish it had more flavour? I could taste quite a bit of lime – a palette cleanser for each dish. We were then served with some bread and feta drizzled with extra virgin olive oil (complimentary). This was so fluffy and light. My friend doesn’t like cheese but she could keep eating it with the bread. We then ordered the special which was quail with lentils and cubed apple. The quail was nice and soft – juicy with the bone. The girls liked it, but I wish the meat could be cooked a little bit more so that the tender pieces of the quail would fall off the bone. Now comes the favourite dish of the night! 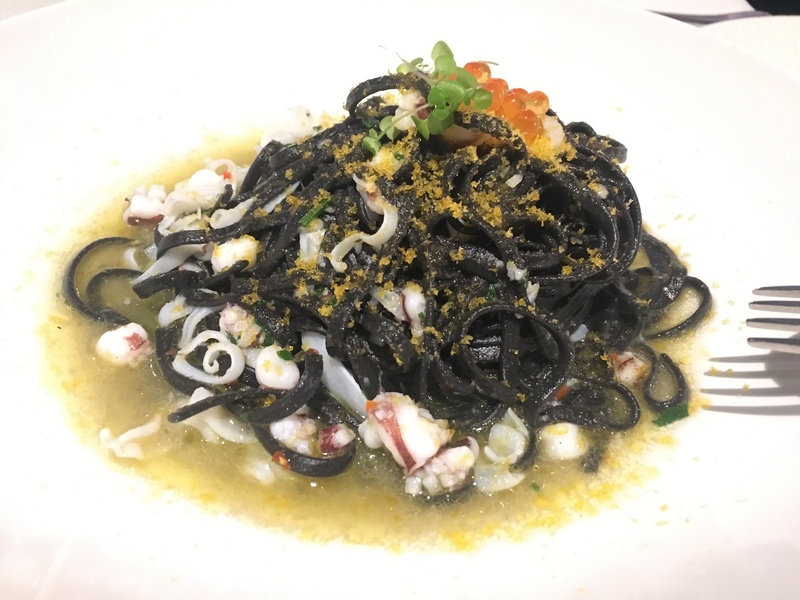 My long awaited aka Tagliolini al nero – squid ink tagliolini, squid & bottarga aka squid ink pasta. The squid was so tenderly soft that it was not chewy! But watch out for the kick at the end of each bite from the sauce. It doesn’t look chilli hey? The roe was amazing! I don’t usually like roe – i’ll eat it if it’s there, but these are big and so so juicy when you bite into them. The burst was very pleasant – not fishy at all. Of course the squid ink pasta was al dente to my liking! Next main was Casarecce – pork sausage, white wine & radicchio, it was a complete change in taste – creamy and a bit heavy from the pork sausage. But I was happy with our selection. The flavour wasn’t as punchy as the squid ink, but was thick, sauced around the short pasta. Small portion of radicchio which I prefer. 2nd side i polenta chips – Polenta fritta – crunchy rosemary chips. Didn’t realise at the time of eating, but now that I see it was suppose to be rosemary – I couldn’t taste any rosemary. This was our least favourite dish of the night. Dry dish, and serving it with parmesan makes it more dry. Wish we could have had aoili or mayo to help moisten this side dish. Overall, the ambience is dim and romantic, but what impressed me is the table lighting. I was able to take great photos from my phone to share here! A lot of restaurants have dim lighting and therefore I can’t take a decent photo of the food. Our waitress was amazing. Accidentally spilled the whole mocktail on the table and she was helping us wipe it down – yes it’s their job, but she gave us abundant napkins to ensure we were dried up! To add to it, she ordered us another mocktail, as N started to get disappointed that she had wasted her drink. Location: 361 Little Bourke Street, Melbourne 3000.